The mayor of South Korea's southeastern city of Changwon will travel to North Korea this week for talks about athletes from the province participating in an international marathon to be held in Pyongyang later this year, officials said. Mayor Huh Sung-moo will be among about 250 people, mostly civic group officials, to visit the North's Mount Kumgang resort on Tuesday and Wednesday for reconciliation events organized by pro-unification organizations of the two sides. During the trip, Huh plans to meet with North Korean officials for discussions about the North's invitation of athletes and officials of South Korea's South Gyeongsang Province to participate in the Pyongyang Marathon on April 7. 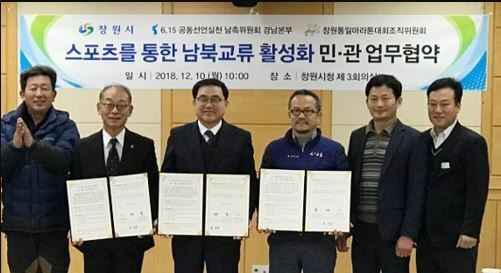 The city of Changwon is trying to facilitate a city-level marathon exchange between the annual Pyongyang event and the city's yearly Changwon Tongil Marathon, having proposed the idea to the North Korean side during an inter-Korean civil society meeting in October in the North Korean capital. Following their interaction in October, the North reportedly invited some 40 marathon runners and officials based in South Gyeongsang Province to the 2019 Pyongyang Marathon through a verbal message during a meeting in Shenyang, China, in November. At the upcoming meeting in Mt. Kumgang, the two sides will seek to discuss the size of the South Korean participation in the North Korean event and other logistics of the team's North Korean trips. They will also seek to draw up a written agreement out of their discussion. If the agreement is finally fixed, officials from the South Gyeongsang branch of the South Korean Committee for Implementation of the June 15 Joint Declaration will fly to North Korea via China.